In Blackjack, also known as Twenty-One, a player plays his or her hand only against the dealer’s hand and the object of the game is to get your hand to total 21 without going over. Cards 2 through 10 are worth their face value, Jacks, Queens and Kings are known as face cards and are worth 10. Aces may be valued as 1 or 11. If your hand matches the dealer’s hand, your hand will be a push and you’ll get your money back. A natural 21 is known as Blackjack and is obtained by getting any face card in combination with an Ace. The Blackjack beats any other 21 and pays 3/2. You’re asking the dealer to give you another card. You may hit as many times as you like without going over 21. You’re satisfied with your cards and you want to stay with what you’ve got. You want to double your bet for a one-card hit. After you’ve received this card, you may not hit again. This allows you to divide a pair of like cards into two different hands. Depending upon which table you’re on, you may re-split should you receive another like card. Also, on some tables you may double down after receiving a second card to your split hands. Generally, split Aces automatically receive only a second card and no further options will be presented. You want to forfeit your hand because you feel that the dealer will beat you (e.g. you’ve got 15 and the dealer is showing an Ace or a 10). By surrendering, you only lose half your bet. You must surrender when holding two cards. After a hit, this option will not be available. Chafing Dishes are a great way to keep your food warm for hours. NOTE: The fountain must be properly grounded to prevent electrical shock. Beverage Fountains are designed to circulate clear beverages. Use of beverages with pulp, seeds, fruit, rinds, ect. Will restrict the flow of beverage and potentially clog the motor. Always use coffee maker on a dry, level surface. With basket and stem removed, fill coffee maker with COLD water to desired measurement. Press stem into heating unit well in bottom of coffee maker, put basket on stem and fill with appropriate amount of coffee (see tables below). Be sure not to let grounds fall through stem. Put cover on coffee maker and plug into 120 volt AC grounded outlet only, turn switch to on. The coffee maker will stop perking automatically. Coffee is ready when light in base glows. Coffee will remain at serving temperature as long as it remains plugged in and switch is on. Before serving, use pot holder to remover stem and basket containing grounds. If this is not done, coffee will become bitter. For cup-on-saucer filling, press faucet handle down. For a continuous flow when filling a coffee server, lift handle straight up until it locks into open position. When coffee can no longer be seen in glass gauge, turn switch to off and unplug coffee maker. Please note: Coffee maker must cool down prior to making a second batch of coffee. One or more laydown mats can be used. Bets are placed on any of the six designs. When the wheel stops, the payoff is according to the position of the clapper. Remember always collect from the losing bets first, then pay the winners! This game is very simple to play and manage. When the clapper stops on the over or the under, then those in this position win an equivalent amount. i.e. They have doubled their money. When the wheel stops, the clapper will point to the odds and the winning horse. The odds are the numbers on the outer edge of the wheel. Be sure that there is plenty of clearance between the player and the spectators. Remember that the risk always exists that the player could lose their grip on the golf club and send it flying backwards. The type of injuries which can result from being struck by a golf club in mid-swing can be severe. Prevent this from happening by assuring a safe distance between player and spectators. If using the game outdoors, it is strongly suggested that you use the stakes provided on either side of the bottom supports. NEVER USE THE GAME IN STRONG WINDS OR LIGHTING. Use caution when setting up or taking down the game – the sections of tubing can come apart and fall down causing injury. Use only the Velcro golf balls included with the game. Select a level area to operate game with plenty of room to allow for a line to form and a safe distance between player and spectators. Assemble framework – note that the eight longer pieces of tubing are used to form the outer edges (2 per side), while the four shorter crimped pieces are used to create the base. Be sure to tighten down the fittings using the small bolts on them. Attach canvas to the framework using the Velcro straps. Never fold up canvas wet – Always allow to dry thoroughly first. On your Final Batch turn kettle heat switch to off as soon as corn starts popping. When popping is complete, turn off motor switch. Keep popcorn warm with light warmer. Troubleshooting: If corn is not popping, ensure the kettle heat switch is on and the sprocket at the top of the kettle is engaged with the kettle motor. Remember your rental fee includes cleaning – do not attempt to clean or dismantle the machine. 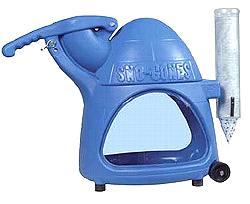 The Snow Cone Machine is simple to operate and a great attraction for any event! NOTE: The machine must be properly grounded to prevent electrical shock. Start the motor and fill neck an inch from the top with ice pieces 3” x 4” or ice cubes. Hint: the larger the ice pieces, the better the snow. Push ice down against the blade with firm pressure using the arm of the machine. Hint: Do not force the handle. Too much pressure will cause coarse ice to form and too little will make it mushy. Do not put anything but ice in the neck of the machine to prevent damage. Keep fingers and long hair away from machine when motor is running or when machine is plugged in to prevent injury. Tiffany Party Rentals by the scheduled date and time. The portable sound system is equipped with a removable travel dolly that features wheels and a retractable handle. To eliminate possible vibration from affecting the performance of the unit, we recommend that you remove the travel dolly before operating the system. Be sure to return travel dolly with equipment after rental period.